The black hole's "belch" is actually a bipolar jet of plasma (ionized gas) that discharges particles from the centre of an accretion disc (a structure that moves material toward its centre – in this case, the black hole). This galactic belch ejects particles, scattering them amongst stars and planets, and may also affect magnetic fields in the galaxy. Astronomers have captured the moment when a black hole launched super-fast "bullets" of gas into space at one-quarter the speed of light, a new study reports. The black hole blasted out the gaseous bullets back in June 2009, and NASA's Rossi X-ray Timing Explorer (RXTE) satellite and the ground-based Very Long Baseline Array (VLBA) radio telescope were able to watch the drama unfold. "Like a referee at a sports game, we essentially rewound the footage on the bullets' progress, pinpointing when they were launched," Gregory Sivakoff, of the University of Alberta in Canada, said in a statement. "With the unique capabilities of RXTE and the VLBA, we can associate their ejection with changes that likely signaled the start of the process." In the new study, researchers analyzed the mid-2009 outburst of a binary system called H1743–322, which is located about 28,000 light-years away toward the constellation Scorpius. This system is composed of a normal star and a black hole, both of whose masses are unknown but appear to be middling. They're so close together that the black hole pulls a continuous stream of matter from its stellar companion, forming an accretion disk millions of miles across. As this matter swirls inward, it is compressed and heated to tens of millions of degrees — so hot that it emits X-rays. In addition, some of the infalling matter gets booted out of the accretion disk as dual, oppositely directed jets. These jets usually contain a steady flow of particles, but they occasionally morph into more powerful outflows that hurl huge blobs of gas into space at incredible speeds, researchers said. H1743–322 underwent such a transition in early June 2009. And RXTE, the VLBA and a few other observatories around the world looked on, capturing the accompanying changes in the system's X-ray and radio emissions. These emissions were steady from May 28 through June 2. The radio component had faded significantly by June 4, only to increase the next day — the same day a bright, radio-emitting bullet of gas racing outward from the system in the direction of one of the jets. 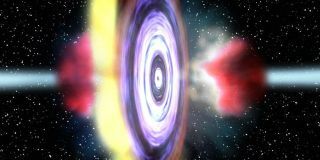 A second bullet, moving in the opposite direction at 25 percent the speed of light — about 168 million mph (270 million kph) — was observed on June 6. Astronomers had previously associated the onset of the radio outburst with the bullet ejections, researchers said. However, the new study determines the bullets were actually fired off several days earlier, on June 3. "This research provides new clues about the conditions needed to initiate a jet and can guide our thinking about how it happens," said Chris Done, an astrophysicist at the University of Durham in England, who was not involved in the study. These images, taken by the Very Long Baseline Array radio telescope, show two gaseous bullets launching from the black hole binary H1743-322 (circled) in June 2009. The new study could shed light on what happens at the heart of active galaxies, which also harbor jet-spewing black holes, though on a much larger scale. These supermassive black holes can be billions of times more massive than our sun, and they can drive enormous outflows extending over millions of light-years, researchers said. "Black hole jets in binary star systems act as fast-forwarded versions of their galactic-scale cousins, giving us insights into how they work and how their enormous energy output can influence the growth of galaxies and clusters of galaxies," said lead researcher James Miller-Jones of Curtin University in Perth, Australia. The study will appear in an upcoming issue of the Monthly Notices of the Royal Astronomical Society.